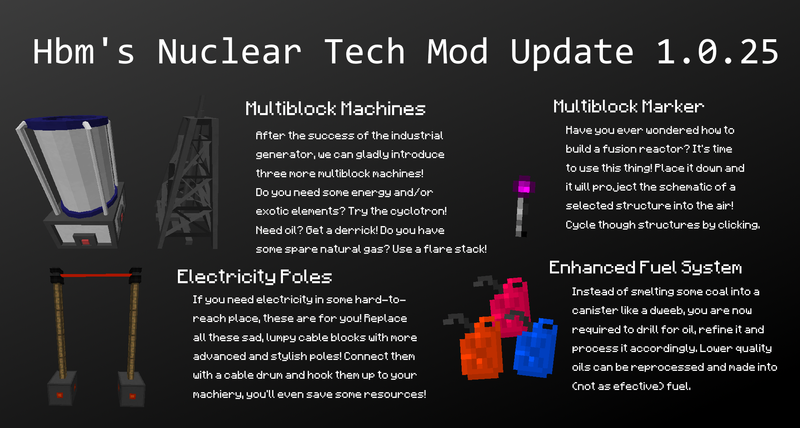 [1.7.10] [1.8.9] Hbm's Nuclear Tech Mod | Nuclear Explosives, Uranium Enrichment and more! THANK YOU FOR 99K DOWNLOADS! There won't be any more 1.8.9 updates, 1.7.10 will still receive updates, though. 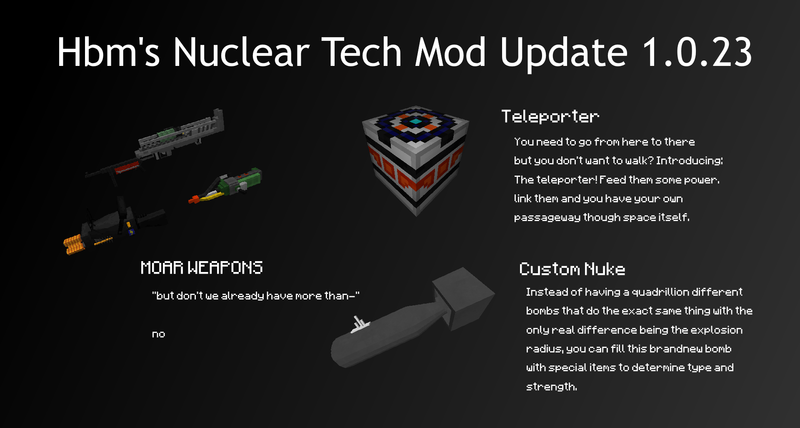 Modpack information: You have to ask for permission to use this mod in a public modpack (which in 90% will be allowed, so don't worry), you can use this mod freely in any private pack in combination with any other mod. There are no known incompatibilities with other mods or any bugs regarding the RF connectors. If you do find a bug, please be sure it is caused by an incompatibility and send me the log. I might be able to fix it, or it's just another ID conflict which is rather easy to resolve. If you do get permission, please try to document the number of downloads your modpack has since this mod was added, I want to know how many people downloaded my mod. Hello there! 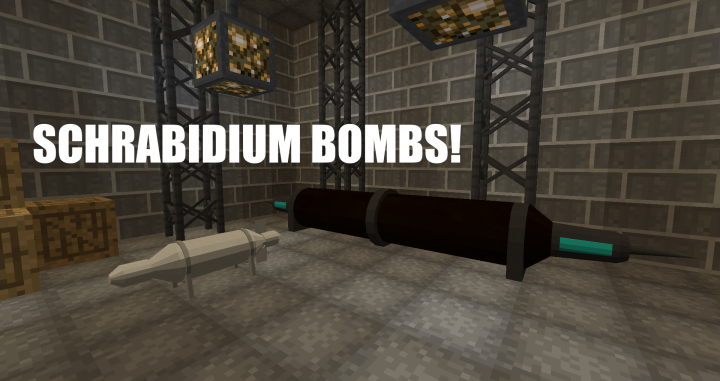 Did you ever wonder if there's a mod which combines explosives with technic (RIP ICBM)? 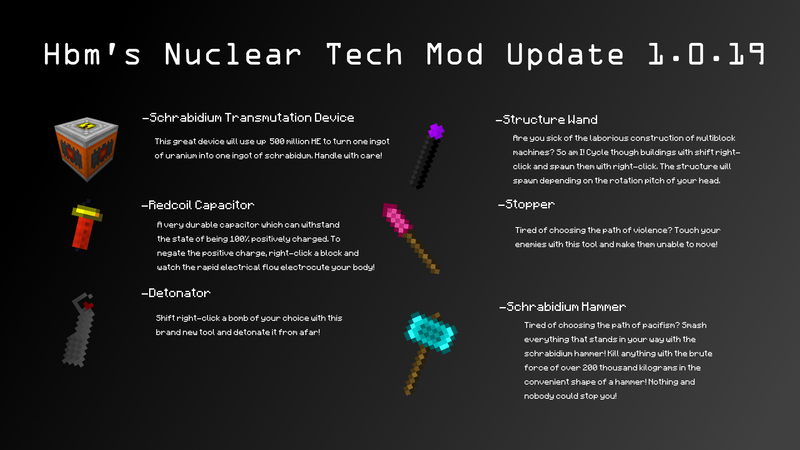 If so, then this mod is for you! That's right! 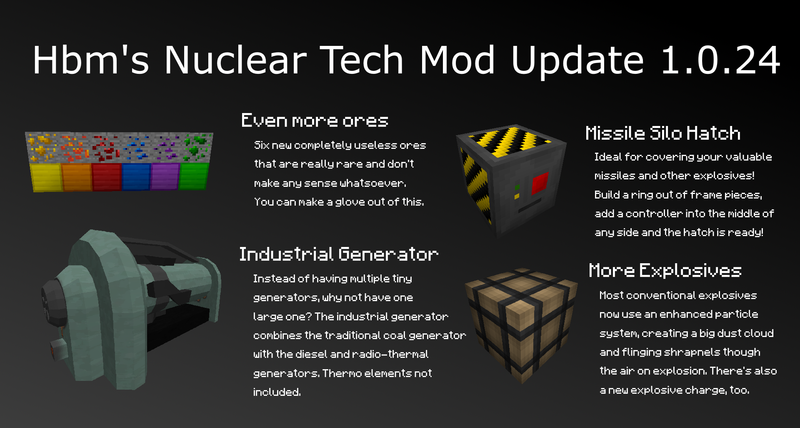 This mod adds bombs, machines, ores, ingots, parts...everything! Almost all items and blocks are craftable (excluding test stuff and bricks) or simply creatable with new furnaces and machines! 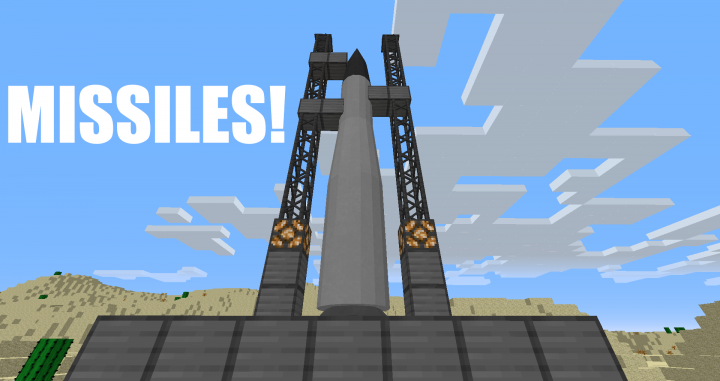 Smelts and combines items, used to create things like steel, Minecraft Grade Copper and neutron reflectors. Looks great. But I'm not so sure about it being genuine. There's pics but (when available->) maybe no clicks. If it is the real McCoy, you sir have done the community a service! Oh, thanks ^^ I've started this project some months ago, and I can assure you I made most of this myself :3 Only a few things aren't original, the explosion algorythm for instance (Rodol Phito helped me with that, and even he got it from a math forum). All models were made with Blender (a great 3D modelling program) and then converted into a wavefront file so the Forge special render loader can use it. Also, I made the item textures myself, some may have a different style, but that's because I recycled some of them (the radioactive ingots and sulfur) from a simular project I started a year ago and never finished. 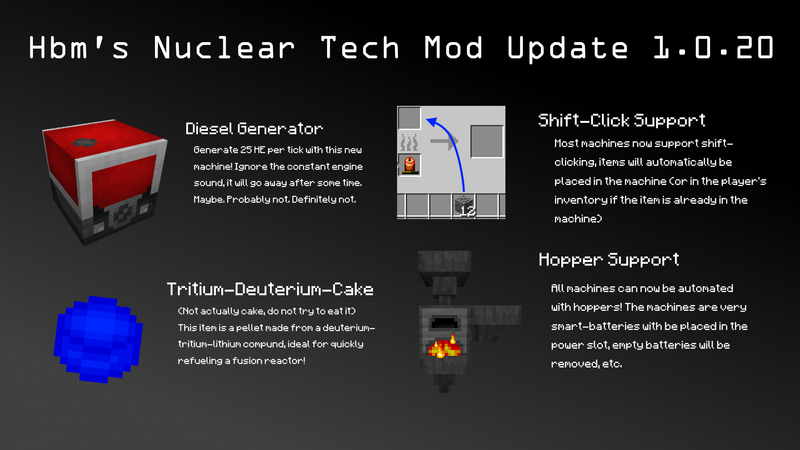 If you place a nuke, you have to right click it to open a GUI. Depending on what bomb you want, you have to fill in diifferent items, the GUI also shows the outline of them. 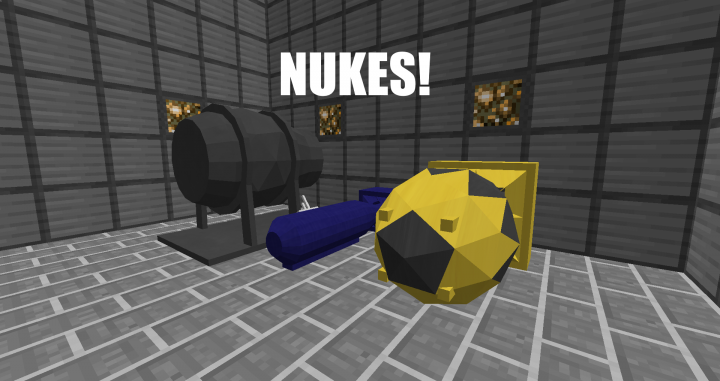 You can find all of those items in the Nuke Creative Tab, and those items even have an item lore which tells you what bomb they belong into. 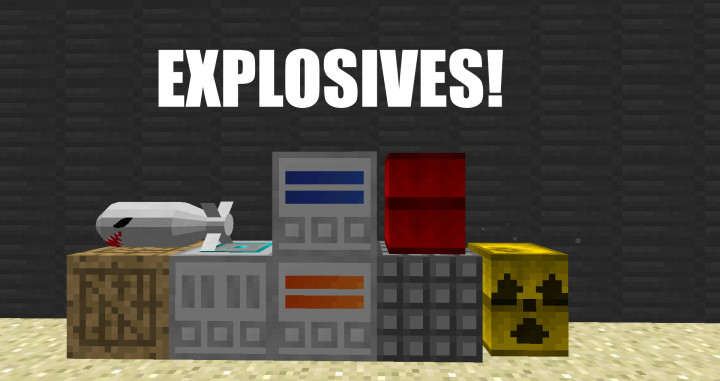 If you want to detonate a multi purpose bomb however, you fill 4 blocks of tnt into the slots marked with a block icon, and then you can add other items into the two other slots, like gun powder, tnt, explosive pellets, fire and poison powder and a gas cartridge. 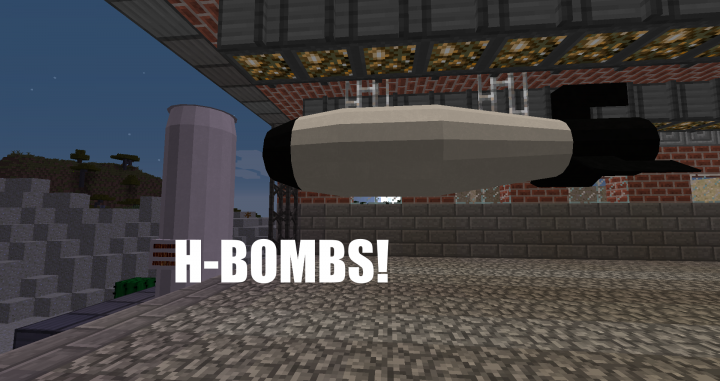 To detonate a bomb, just be sure everything is filled up (if that's the case, a little atom logo will appear in the GUI) and then power it with redstone! Time for me to find a nice map to destroy wastefully! Cant wait to see where this gos!! Wait, what? I check my channel every day, I didn't get a message, but this is absolutely AWESOME! 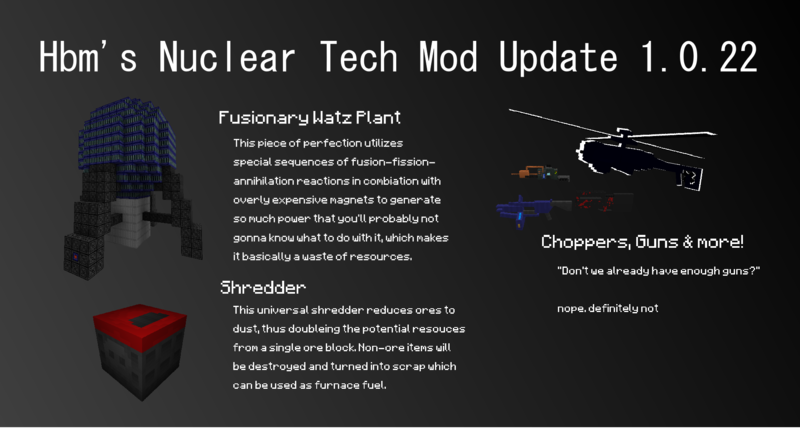 I really should add some more info to the page, the Plutonium 238 Pellet can be used as fuel for the alloy furnace, the breeding reactor and the centrifuge. The political topic, the drawing of a pony, the opinion and the conspiracy theory are used to craft the Flame War in a Box, which is like a TNT block which sets everything on fire. 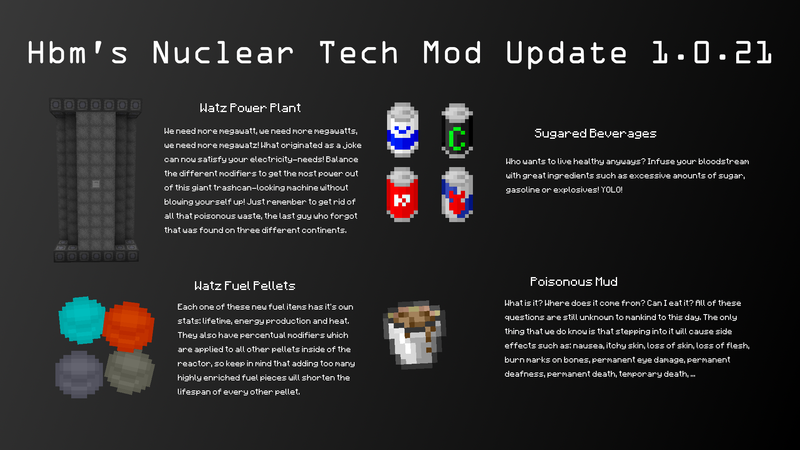 This mod needs more attention. Also how do the bombs work? Is it like anti matter where everything is destroyed no matter what, or is ot like icbm's lesser bombs. Were explosions actually change if there is something in the way. All blocks in the way will be destroyed, except for reinforced ones (well, I could add a ray trace to prevent blocks from being destroyed when they are covered, but I'm going to add that later) Most bombs have a rather slow but lag free spiral algorythm, which creates a flat crater. There is also a mushroom cloud, but it's not SMP compatible yet. I'm going to think of a better solution than particles. 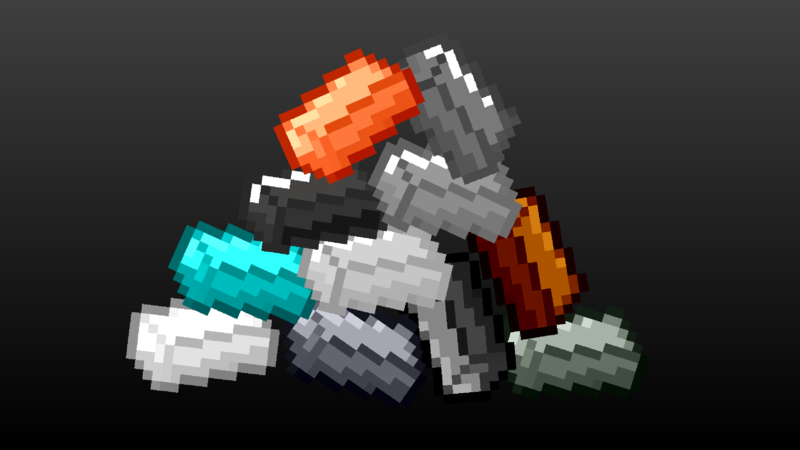 Btw, there will be more guns soon. Also: missiles. And cake. And 100% more Schrabauer. Maybe. Great job hbm, keep it up!